"A god of unparalleled evil lurks at the edge of the Game World. This vile creature, Makuamuuge, declares a revolt against the Game World and sends his loyal and steadfast foot soldiers into the Human World to unleash his master plan. Only by twisting the very nature of the Human World can they bring about the total victory of evil. Confronted by a worthy adversary, they are forced to resort to ever more malicious tactics. The fearless and noble Goemon from Game World's lost city of Edo, the protector of all that is good, may have the strength, the will and the sweet rice balls to prevail over this insidious threat. The series stays loyal to the colorful characters and wacky sense of humor that attracted so many to the game while introducing a storyline that will appeal to all game players. 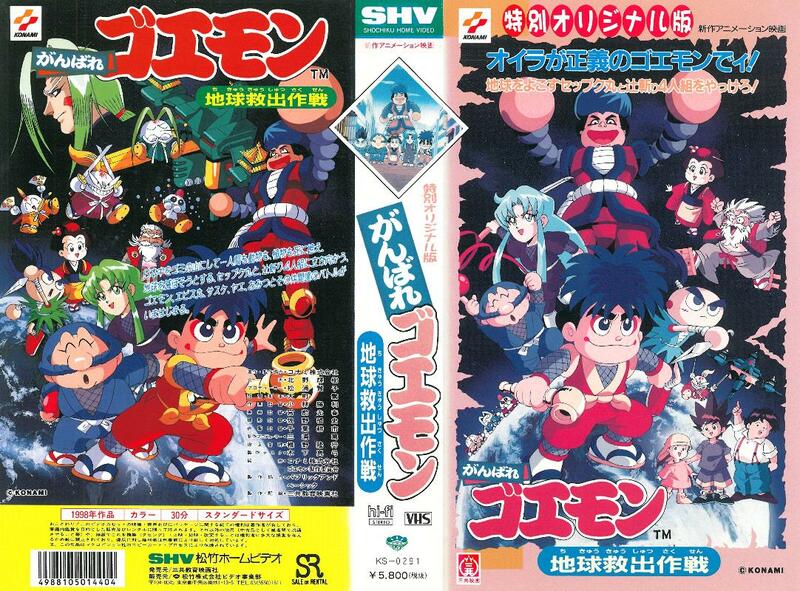 Using a television as a portal, the brightly coiffed Goemon, hero of both the game and the series, crosses from the game world to the human world to save humankind from an invasion of the video game world's most undesirable citizens. Legend of the Mystical Ninja is a unique anime series that ties together themes of friendship and family against a backdrop of action and comedy that will bring in game and anime fans alike." 01 - I'm the Goemon of Justice! Life for Tsukasa will never be the same. His world has been invaded by video game characters, and they're coming from his TV! He meets Goemon who has come to the human world looking for Seppukumaru. Seppukumaru is sent to this world on the orders of causing total destruction by the vile Makuamuuge. Only with enough chaos is the rage gauge able to be filled, and Seppukumaru is able to succeed in doing so. He summons the cyber monster Gamagahma. Goemon will need help, but he doesn't have the power to call Goemon Impact. He needs ohagi! Goemon: "Astonish the world, Goemon Impact"
Goemon: "Prepare yourselves! For he who took as his birthright in Game World's lost city of Oedo total goodness and honesty, a despiser of evil...Goemon!" Goemon: "Prepare yourself. I am he who has traveled from Game World. Just what is Game World? It is a land of no great size. There, in the lost city of Oedo, there are those who take as their birthright the strength to defend the weak! Goemon: "So long as I am here, you will be thwarted!" 02 - City in Bloom, City in Bloom! Goemon and the others decide it's time to see the town. It looks like a nice day for them, but Seppukumaru has been out as well, observing humans. He discovers fear will be his next source of evil and it will come from all of the people in the city. Goemon is unable to stop Seppukumaru's rage guage from being filled, and another monster is summoned. Goemon must fight Garugarasu with Goemon Impact, but he is damaged. It's up to Monoshiri to fix it! Monoshiri: "I am Moji Monoshirinosuke. They call me Old Man Monoshiri." It looks like an exciting day for Tsukasa and Asuka as they head to the stadium to watch the allstar soccer player, Mr. Jojima. Although not everything is fun and games, for Seppukumaru has summoned the cyber monsters Noto and Rooda! Concealed within in them is a bomb that is powerful enough to create a cyber tunnel for Lord Makuamuuge. The bomb will need to be dismantled; enter Sasuke! 04 - Zanpan Loves Eating Weird Stuff! Strange things are happening at Tsukasa's school. This undoubtedly looks like the work of Seppukumaru. For he believes children will be a more relible source for collecting energy. Thus, he is able to call upon Zanpan. This monster will eat anything, and its up to Goemon Impact to defeat him! 05 - A Big Arrest in Ninja Village! There is a place in the real world modeled after oedo! Tsukasa hopes to impress Asuka by completing the Ninja Training Course and asks Goemon for help. However things go awry when Seppukumaru kidnaps Omitsu. It will be Goemon's toughest battle yet! 06 - I've Had Enough of This Jam-packed Train! Seppukumaru needs new sources for his rage gauge. He discovers many people ride the train, and makes it his next target. It just so happens that Goemon and Tsukasa are on the train as well. But that won't stop Seppukumaru from calling his next cyber monster, Debudebu! An endless stream of them are summoned forth, each one fusing together to form one giant enemy...an enemy so devious not even Impact's attacks will work! If justice wants to prevail, Goemon will need to come up with a new strategy. 07 - It's Camping, It's a Bear and It's a Fire! Orignal Title キャンプだ! クマだ! 山火事でイ! What starts off as an exciting day of camping quickly turns into one of disaster thanks to Seppukumaru. Threatened by his master Makuamuuge for his constant failures, Seppukumaru has now become more determined than ever. He'll do everything in his power to stop Goemon, and he'll be using the beautiful forest as his catalyst. 08 - I'm a Bodyguard For a Selfish Idol! Goemon has been forced to become the bodyguard for the idol pop-star, Rumie Himuro. Rumie is a talented young women, but nonetheless a spoiled and self-centered brat. She has lost all motivation to sing and doesn't care about the feelings of her fans. If she doesn't show for her concert she would be giving Seppukumaru the perfect opportunity to call another cyber monster to attack the real world. Can Goemon help her find her way, or will her fans be disappointed? 09 - Dad Fights in the Name of Justice at the TV Station! Seppukumaru has come up with a way to mess with the TV Station. Using the cyber monster Televing, Seppukumaru will take out each channel one by one with Televing's ability to scramble machines. With each station that goes out, the rage gauge fills more and more, and Televing grows bigger. It even scrambles the controls for Goemon Impact. Goemon is going to need help for this one. 10 - The Sweet Diet is The Evil Trap! Seppukumaru's time is running out. With each failure Makuamuuge grows angrier. He has come up with one more plan: a powder that causes humans to lose weight. The effect however is only temporary because ultimately the powder makes you gain weight causing the victim to blow up like a balloon. Not only does this powder cause everyone to get chubby, but it works on Impact as well. How will Goemon be able to fight back? Goemon: "The honorable Goemon never lies." Fat(ter) Ebisumaru: "Why is Sasuke still skinny?" Sasuke: "I'm a robot, Ebisumaru. I don't have to worry about things like gaining weight." Seppukumaru: "You honestly think you can defeat me now that you gotten so fat?" 11 - Santa Claus is a New Villain! Seppukumaru's failures have finally caught up with him. After being cast into the "Dark Muuge Hole" Makuamuuge unleashes a whole new threat upon the human world: Dr. Mudanashi, creator of the cyber tunnel, and his android bodyguard, Mr. Protein. Can Goemon match wits with this new evil scientist? Or will our heroes be caught of guard when they come disguised as Santa Claus? 12 - The Theme Park is Full of Girls! Asuka invites Tsukasa and Goemon along on a trip to a theme park starred after a cute character called Alice. However, Asuka's day of fun is ended when Dr. Mudanashi arrives on the scene. No one is allowed to leave, and what's worse, no one is coming back from the rides! 13 - An Avalanche Rushes Down on the Ski Resort! 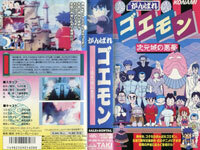 The battle between Goemon and Dr. Mudanashi continues when Tsukasa and his family visit a ski resort. Mudanashi will go to all lengths to destroy what he deems 'wastefulness' and the ski resort is no exception. It will be an icy battle between Mudanashi's next invention and Goemon Impact. 14 - They Stole Our Time! Everyone is in Chaos! Dr. Mudanashi has figured out how to control time and leaves the human world in a state of chaos. No one in the human world is able to function without time, creating the perfect energy needed for the rage gauge. It's up to Goemon to stop him, but he'll need to get back to the present first! Mudanashi (to Goemon): "When do you use a clock?" Goemon: "Well, I get up when the sun shines in my eyes. And I eat when I am hungry..."
Wiseman's Alarm Clock: "I like girls with brown hair, I like girls with white skin, girls, girls, girls, girls, girls, girls, girls, girls." 15 - Gigantic Art Objects Go on a Wild Rampage! Tsukasa's art project is chosen for a special award. To further his abilities he'll get to train with a real artist, Mr. Shinoyuki Kumahara. Meanwhile Mudanashi conjures a way to bring artwork to life and uses them to terrorize the city. Goemon: "Save the weak and defeat the evil. I am the super hero Goemon!" 16 - A Big Explosion at the Robot Exhibition! A robot exhibition in town is offering a free trip to Hawaii. Many enter the contest. Noboru, Tsukasa, Monoshiri, Sasuke, and of course the infamous Dr. Mudanshi. Yes, it's another battle of good vs. evil but now there is a little love; Protein has fallen for Sasuke! 17 - A Chocolate Panic on Valentine's Day! Valentine's Day. A day supposedly full of kind and loving gestures is transformed into one of hatred leaving everyone heartbroken, especially Tsukasa. Will Goemon be able to cheer him up and bring justice to St. Valentine's Day? He's fighting in the name of true love! Goemon (to Tsukasa): "I know your appearance and grades are average, same for your athletic ability. You're not rich either. On top of that you have freckles and you're near sighted! But! You're a nice guy!" 18 - I Don't Want to Eat Devil's Food! A cooking contest in town is offering three million yen and a brand new kitchen. Tsukasa signs his mother up. The competition is a perfect target for Mudanashi's chaos, but he might have another reason for his cruelty this time. Dr. Mudanashi has fallen in love with Tsukasa's mom and he'll do anything to get her attention. 19 - Jealousy is a Rice Cake You Can't Eat! Mudanashi, coping with his broken heart, is out to destroy all love. By using jealousy he can tear people apart and supply ample energy to the rage gauge. Even Omitsu falls victim to it leaving Goemon without ohagi and the energy he needs to fight back. 20 - A Noisy Machine Drives Everyone Nuts! Dr. Mudanashi swears he will no longer be a victim to love, and with that comes another maniacal plan to open the cyber tunnel. To make matters worse, Sasuke has gone missing. Tsukasa and Ebisumaru are the only ones left who are uneffected by Mudanashi's machine. It's up to the "blue" ninja of justice to save the day this time! Ebisumaru: "My secret weapon, the big Osaka Slapstick Routine!" 21 - A Runaway Special Express Train! There is a new bullet train that travels all the way around Japan. Noboru gives Tsukasa and the rest of his class a special invite to ride on the train for its grand opening. The train travels at amazing speeds, but when Mudanashi hijacks the train he pushes it way past the norm. What will happen to the train if it passes the sound barrier? Mudanashi has hijacked a shuttle and is headed straight for space. He plans to take out all of the orbiting satellites in hopes of raising enough energy for Lord Makuamuuge. This time his plan will go without fail, but Mudanashi didn't expect Tsukasa being taken along with him. Can Goemon reach him in time and stop Mudanashi once and for all? Mudanashi continues to fill the rage gauge with energy and every passing moment makes the cyber tunnel grow larger. This is the final battle between good vs. evil. The fate of the world is resting in the hands of Goemon, the hero of all that is good! Ganbare Goemon! Seppukumaru kidnaps children, brainwashes them, and uses them to collect hordes of garbage. His plan is to devastate the planet with pollution. 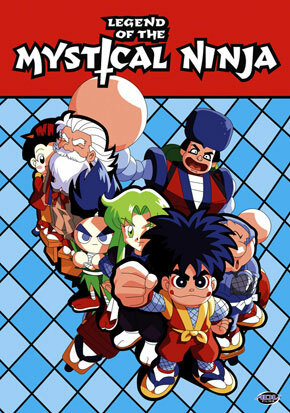 It's up to Goemon and gang to save the day! The Lord of the Dimensional Castle has kidnapped Omitsu. 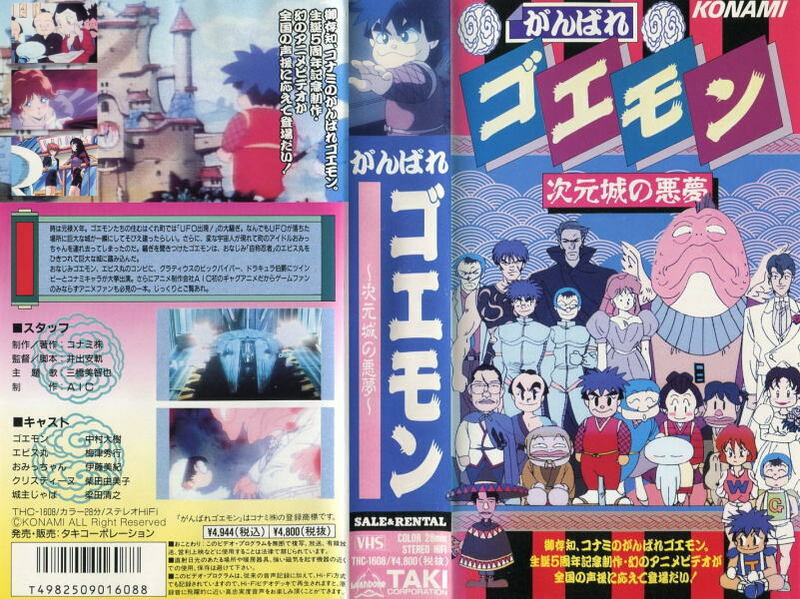 Goemon and Ebisumaru must enter the castle to rescue her!